One of the banners that resonate in my memory protested the often negative representations of Pacific Islanders in the mainstream media and it also reminded us Pacific people of the importance of our original teachings and homelands. “Moana is not a Disney Movie, She is our Grandmother, Our Pacific Ocean, ” it said. Like all of the signs that we proudly held that day, this one explicitly renders us visible here in the U.S. by reminding us that we Pacific Islanders are Indigenous peoples from the Moana. We are not API, and we refuse to be silenced within this contemporary racialization that further invisibilizes our communities. Like our Native American relatives that we marched alongside with in the Indigenous Block, our connections to our Creator, our ancestors that includes our lands and oceans, as well as grandparents and the spirits of children, not yet born, are all va, or sacred connections, which are central to our identities and our survival as Indigenous peoples from the Pacific. Thus, the many images of our Pacific Islander contingent at the march unabashedly retell stories about ourselves and our Pacific Islander communities that counter the colonial myths deployed to imprison and dehumanize us. The images of us from that historic moment remind us that the medicine for our personal healing and our collective healing as a community lies within ourselves and within our communities. The medicine for our wounds lie in the heart of our struggles and our resistances. The images from that historic moment remind us of the significant gifts that each individual, and each respective Pacific community, shared so generously with each other and with our collective. I am reminded of the important gifts shared by our Marshallese brothers and sisters. They marched behind big banners. One beautiful banner stated, “Our Tides are too High So we Rise for our Grandchildren.” They also offered heart-felt chants and songs in their Indigenous language to empower and motivate us throughout the march. In fact, their generous offerings of songs and prayers were the medicine that led us, compassionately, to the finish line. Moreover, at the end of the march when we were wet, tired and ready to fall, our Marshallese brothers and sisters, once again, lifted us up. They shared a prayer and prayer-song in their Indigenous language on the main stage. The closing prayer song was an offering shared with the crowds of thousands that attended the march. During their heart-felt message, I observed that they moved the crowds to reverence and many of us to tears. Their prayer-song was medicine for our spirits. At that precise moment, we stood tall, unabashed, and connected to each other and to the spirits of our ancestors. It was a beautiful moment to be alive, to be a Pacific Islander and to be part of a movement of Pacific Islanders united not only in our struggles against Climate Change but united in our struggles for Pacific Islander self-determination. Photo by Jean Melesaine. 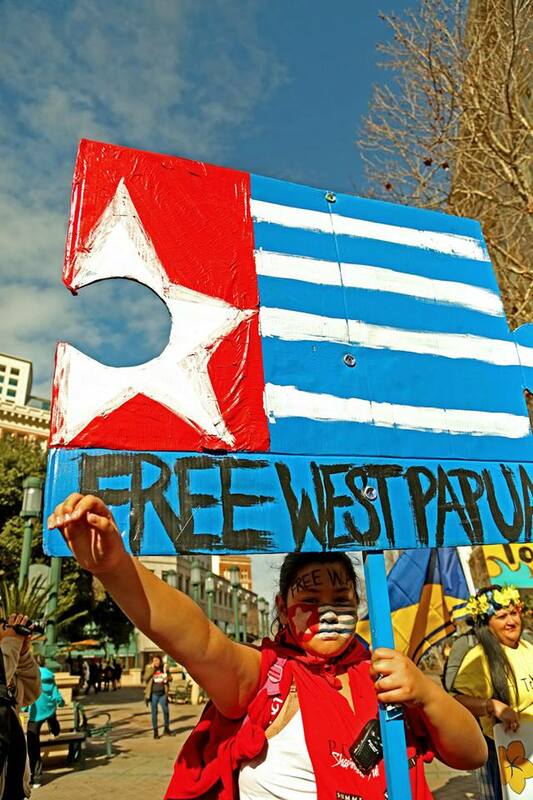 A protester at the Climate Change March holds a sign in the shape of the West Papua Morning Star flag, with the words: Free West Papua. On that historical day in Oakland, and contrary to the colonial narrative, our beloved Marshellese family took their rightful role as warriors at the forefront of our movement. Our relatives from the Marshall Islands, a nation located within the Micronesian region of the Pacific, that we once held intimately as a close relation, had been unfortunately severed as a consequence of Western colonization. Thus, from that separation, the Pacific regions, Micronesia and Melanesia, were designated “other” even within the Pacific Islander community, while Polynesia, although also marginalized by the West, was often privileged and offered more opportunities for visibility. Hence, it is not surprising that Polynesians are often the only population included within the term “Pacific Islander.” But out on the streets of Oakland that historical day in February 2015, our lives depended on our Marshallese relatives and, in turn, they courageously carried us to the finish line. Yes, they courageous carried us home. This new home we’ve created is a home that can shelter all of us, especially those of us that have been marginalized or cast aside. This is a new home built on our collective struggles, resistances and inexorable love for our ancestors and for each other. So beautiful, so powerful, so true. Re-blogging with love and respect. A strong and loving reminder of a day where we marched side-by-side with our Pacific Islander sisters and brothers who are on the front lines of climate change. Much love and thanks. Pingi! Mahalo for reading, and aloha pumehana.